Sorry but I do love silly puns and I have been making paws. 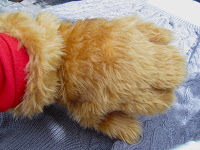 They are for a mascot costume - a dog. 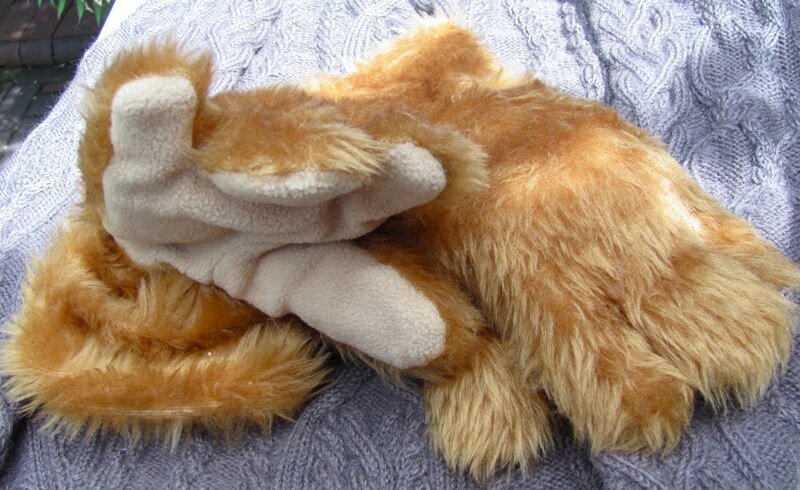 Built around a pair of cotton gloves, padded and 2 fingers are stitched together for that cartoon animal look. I was having a lot of angst about making these paws as I've seen quite a few disasters with costume gloves and animal paws. But I made these about 3 dozen times in-my-head and when I finally plucked up the courage to sew them for real - they went really smoothly :-) I'm quite chuffed with them as I think they achieve that compromise between looking like a cartoon animal & being wearable. This was the prettiest free pattern I could find on Ravelry (if you are a Rav member here is a link ) I used "jitterbug" Colinette's sock yarn. 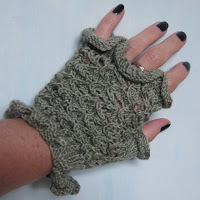 The 'real' mitts for the stage production will not be so pretty - I think I'm going to be knitting in distressing; holes etc to make them look old & tatty. Urrrrgh way to Steptoe!